Where you hang your art is extremely important. Otherwise it feels uncomfortable – a bit like a shoe that doesn’t fit. Every piece has to blend with its surroundings and the spacing has to be just right. Here’s some helpful advice to help each painting work in harmony with your home or office. Not many people realise that curating art in your personal space is just as important as where you place furniture. I see so many living rooms and offices where badly hung art stands out like a pair of ill fitted curtains. Fortunately though, most problems can be sorted out with little tweaks. I remember the time when I walked into a client’s apartment in London. The first thing I noticed was that two huge paintings on opposites walls looked out of place. I immediately suggested swapping the paintings around. At first my client was unconvinced because the paintings matched the colour of the furniture underneath. However because the paintings were the wrong proportions, I persuaded her that the colours were irrelevant. We swapped the paintings around and boy did it make a difference! Suddenly there was a shift in the room and the energy just flowed. The eye was able to follow the line of colour through the room – which now emanated balance and harmony – and we were able to find space for another painting that had been lying on the floor. My client and her husband were absolutely delighted. Sometimes something this simple can really complete a room. Because we purchase art with out hearts, it will often fit into our homes automatically. But this isn’t always the case. You must hang art where it fits, so it sinks into the wall and doesn’t scream at the other things around it. It mustn’t be either overpowering or, for that matter, underwhelming. If you fall in love with a piece, don’t automatically give it pride of place above the sofa. If it’s a relatively small painting, the large space around it might make it harder to appreciate. Instead hang it in a beautiful space. Hang art approx 25cm above sofa and keep it 1/2 or 2/3 of the sofa length. 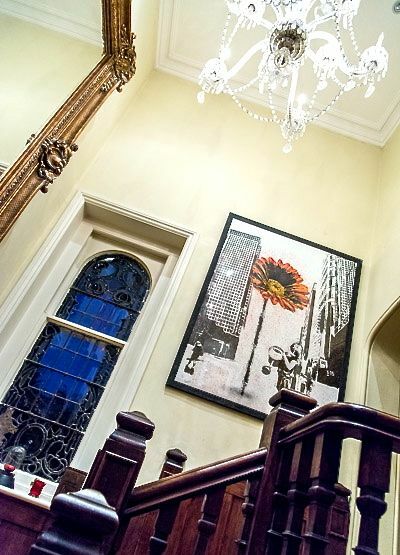 Try hanging a cluster of smaller paintings if you don’t have a large focal piece. It’s good to start in the middle and then work outward with the largest one in the middle. Remember that bigger is always better than too small. Find the right wall for your small artwork. Keep paintings at eye level. Natural light is best but take care when hanging watercolours. And remember that prints in direct sunlight can fade pretty quickly. If you’d like more advice don’t hesitate to give me a call on 07876 253324 or email iaysha@iaysha.com. It’s a particularly good time to call me if you’re moving home or office. I can tell you exactly where to place your collection in your new surroundings.